Anwyn Studio is an open, bright space in Portsmouth Village, in which small, human moments occur. This afternoon, I’ve come to learn to a new skill using hand-dyed, natural wool. The owner, Meriel Taylor, is calmly making lego-shaped paper invitations for a child’s birthday party with her girlfriend. A young boy is playing nearby; his baby brother fusses on the couch. Because their mother is looking a little overwhelmed, I happily insert myself into the process so the mother can nurse. Handspinning wool is an ancient textile art, where you twist fibres, fleece or wool into a continuous thread with a spinning wheel or a drop spindle. The mother becomes more agitated, thinking that she’s taking me from something important, so I assure her that I’m here to relax and can think of nothing more wonderful than making lego invitations. The new skill I want to learn will take but a few moments and I can easily take in the studio as I cut and paste. The studio walls are adorned with similar yarns, some in batt form for spinning, some spun and plied, and ready for knitting. Drop spindles, knitting supplies and even felting supplies—all the tools necessary for enjoying “slow fashion” skills involving wool are nestled enticingly on shelves. The studio epitomizes homemade, local, and beautiful. 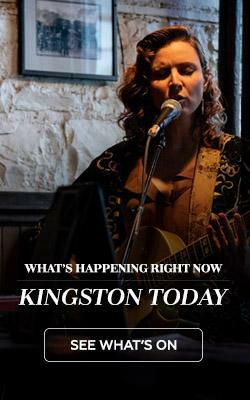 “How did Sunday’s stall at the Memorial Centre Farmers’ Market go?” I ask Meriel. I hope to purchase a kit—consisting of three hand-dyed lots of local, organic wool and a wooden drop spindle—if she has any left. “I sold many bags of it!” Meriel tells me, brightly. In fact, she only has one kit left. “Will green be alright?” she asks. It’s a delicious combination of earthy shades, and it will be more than alright. It will be perfect. 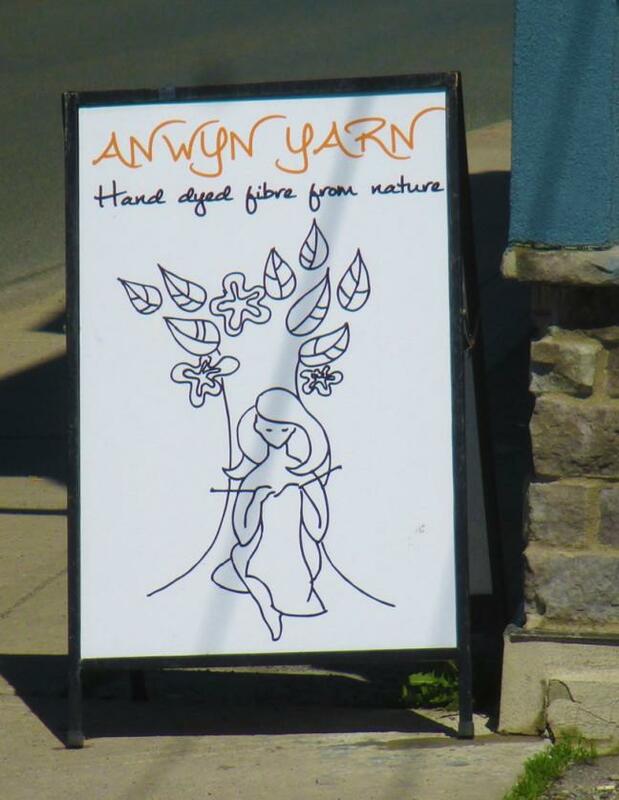 Anwyn Studio at a local Market. “That sounds like fun!” I say, noting that my new friend and her boy are now tranquilly colouring; the baby is fed and asleep on the couch. The atmosphere at Anwyn Studio can have that effect on you, I suspect. 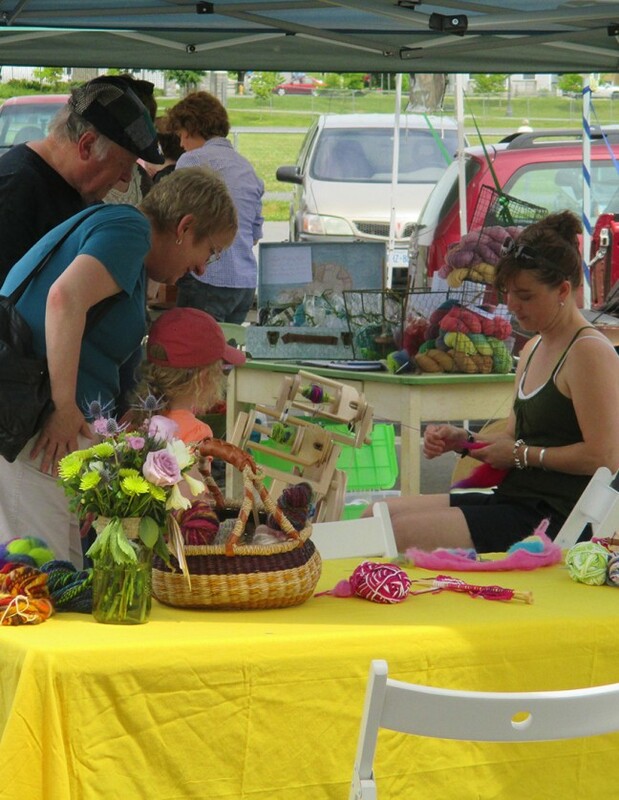 Handcrafts offer us so much more. According to recent studies, handcrafts are therapeutic—a powerful distractant, helping people manage long-term physical pain. They’re a motivator during depressive episodes. They’re a conversation starter, allowing shy people to interact politely without requiring eye contact. They build confidence and self-esteem. Skills like spinning, felting and knitting are calming, they improve concentration, can reduce the risk of dementia and they offer a break from our technology-saturated world. And, they make people happy. The lego invitations complete, Meriel and I curl up on the couch where she ties a leader of fibre onto my spindle and starts my line. Meriel then demonstrates the park and draft method of spinning. 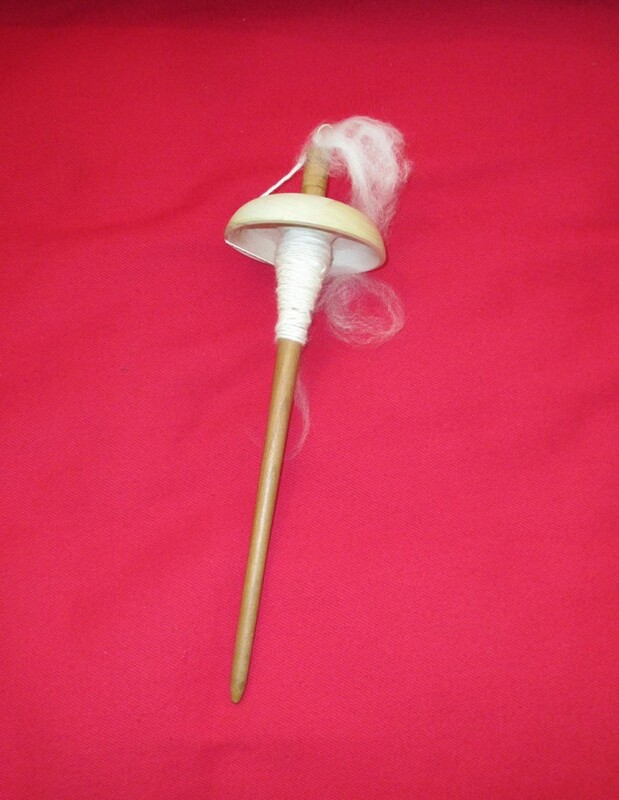 Park and draft is a simplified form of drop spindle where you spin a small length of previously drafted fibre and then ‘park’ the spindle between your knees. The spindle stops spinning, which allows you the freedom to concentrate on drafting more fibre for the next spin. My new spindle is small and portable, and the techniques involved are easy to learn and satisfying to practice. Once I gain confidence with the park and draft method, Meriel encourages me to combine the skills, drafting fibre as the spindle continues to spin. A spindle up close and personal. Within ten minutes, I’ve learned a marvellous, new skill based on an ancient craft. The mom and her boys are preparing to leave, so I rise to join their exit. My drop spindle kit fits nicely into my bag, the textured wool and the meadow of greens peeking over my shoulder are likely to draw attention in the village on my walk home.